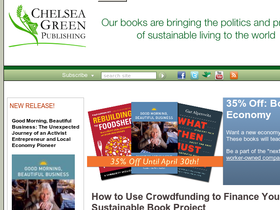 Chelsea Green Publishing, online at ChelseaGreen.com, is your destination for books and information about the practice of sustainable living. Chelsea Green Publishing sells books including: The Man Who Planted Trees by Jean Giono, Michael McCurdy, and Andy Lipkis, The End of America by Naomi Wolf, and When Technology Fails Revised and Expanded by Matthew Stein. Chelsea Green Publishing also features information about how to contact speakers to talk about the subject of sustainable living and also has articles and publishes blogs. RetailSteal.com has the best Chelsea Green Publishing coupon codes, Chelsea Green Publishing discounts, Chelsea Green Publishing coupons, and Chelsea Green Publishing promo codes. Shipping and handling rates at Chelsea Green Publishing depend on the pricing of your purchase and your shipping destination. See website for full details, exclusions may apply. Take 35% off any order using the coupon code when shopping online. Click to save. Use the coupon code to take 20% off your online purchase at Chelsea Green Publishing. Click link to save. Shop online at ChelseaGreen.com and enjoy up to 40% off a wide range of sustainable living books. Get free shipping on orders over $100 when shopping online at ChelseaGreen.com. Click to save. Use the coupon code to buy select books for only $5.99 at Chelsea Green Publishing. Click link for savings. Sign up for the newsletter at Chelsea Green Publishing and receive 25% off your next purchase. Click link to shop. Check out Chelsea Green Publishing and you'll find a huge selection of books, including organic gardening books from as low as $10. Buy This Organic Life book by Joan Dye Gussow for only $14.96. Click link to purchase. Shop Chelsea Green Publishing online and save $35 off your purchase of $100 or more with promo code.